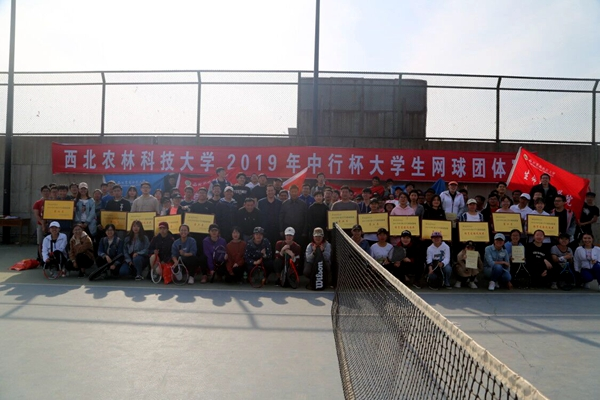 From March 30th to 31st, 2019 NWAFU Tennis Team Competition for College Students was held in the North Campus tennis court. Teams from 21 colleges of our university participated in the competition. After two-day fierce competition, the team of College of Animal Sciences won the championship while the second prize went to the teams of College of Information Engineering and third prize to the college of Economics and Management. The fourth to eighth prizes were taken by the College of Life Science, the College of Palnt Protection, the College of Mechanical and Electrical Engineering, the College of Natural Resources and Environment, and the College of Sciences. The College of Humanities and Social Development, the College of Sciences, the College of Food Science and Engineering, and the College of Veterinary Medicine have won the Spiritual Civilization Award. The annual inter-college tennis team competition not only provides opportunities for students to learn from each other and improve their skills, but also cultivates the spirit of unity, cooperation and courage. It has been increasingly popular among the students. Many tennis beginners have grown to be the major players of their teams by taking tennis training courses and participating in more competitions. Under the guidance of the high-level sports team and the capable member-coaches, the tennis has been greatly promoted and improved, which is of great evidence from the annual team competition.